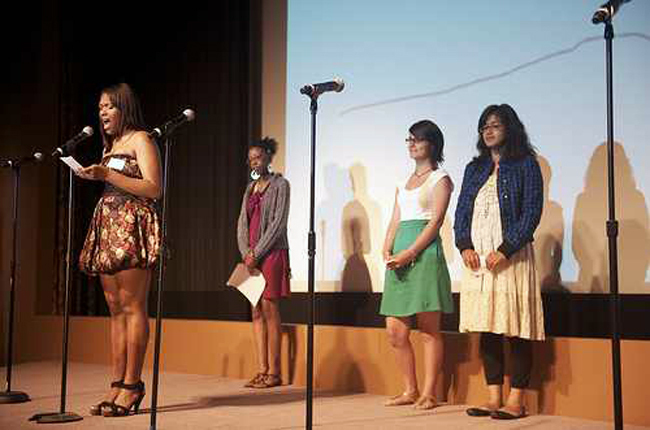 A group of WriteGirl teens perform their work at the Writers Guild of America Theater. *A year ago, Malala Yousafzai, a Pakistani teenage girl, was shot by the Taliban for standing up for girls' education, and, against all odds, she survived. *Malala’s story sparked a fire that burns across my horizons with the plum passion of a dragon hearth and tenderness of a soft lighted candle. Today, that flame still burns. Today, women are still triumphantly pioneering a path down an unpaved road of thoughts, careers, and educational access that was previously inaccessible. Today, girls are learning not to underestimate the power of a pen or the power of dreams. Martin Luther King Jr. said “I have a dream today.” Nevertheless, I know I do not have a dream for tomorrow, nor next week, month, or year. I have a dream for now. My dream to see our world evolve towards the limitless powers of education is heartened today. Recently we lost a fellow dreamer, Nelson Mandela. But it fills me with obstinate and loving hope to realize that with every lost dreamer is a perpetuated dream, and room for more dreamers to come.